I'm here today to share a card I made for my sister, so Emily - NO PEEKING. I used the new Hero Arts In the Kitchen digikit. I've never made a 'new kitchen' card before - but she's so excited about it that I couldn't resist! Adorable! Love how the spatulas and spoons are hanging from the twine! So cute and original...she will love this Lucy! How fun and clever is this? It's so special and I'm sure Emily will love it! Great idea and such a sweet thing for you to do! Emily will love it! 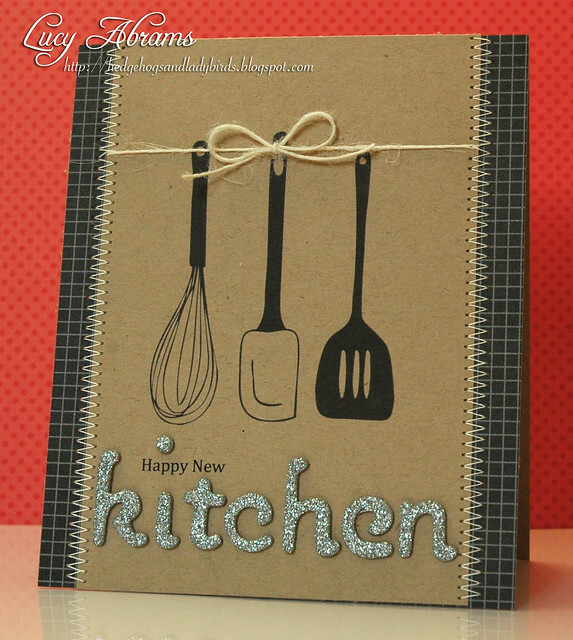 Great card, Lucy, the sparkly "kitchen" letters are the perfect touch! So fun, love the utensils...so great for home re-modeling projects!! That's a brilliant card Lucy ... so very clever! Oh no! I peeked! Saw the card before I saw your "no peeking" instructions! Looked at it and thought, "gosh, Lucy should really send me a lovely New Kitchen card like that" :) Thank you so much! I shall look forward to admiring it in card form! AND its black and stainless steel, like my kitchen! This card is so cool! I love evreything about it! But those glittery letters most!